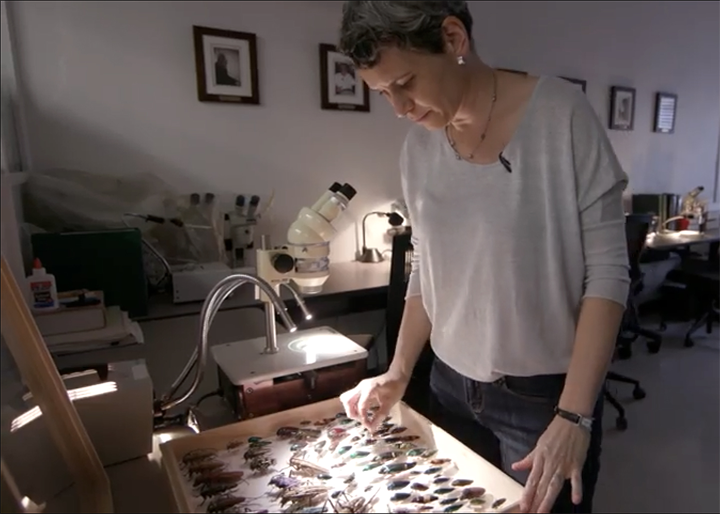 Cara Gibson prepares insect specimens from the Department of Entomology's teaching collection to show visitors. 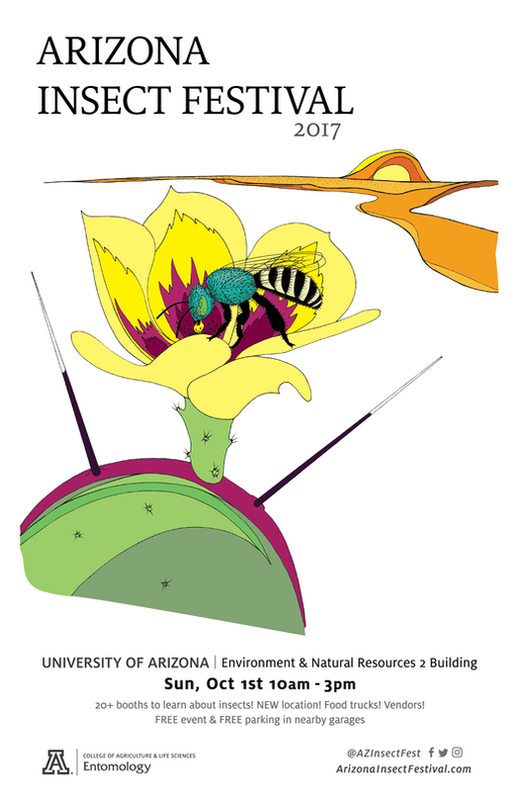 An illustration of this year's theme insect, the honey-bellied green metallic sweat bee, is featured on the poster for the 2017 Arizona Insect Festival. 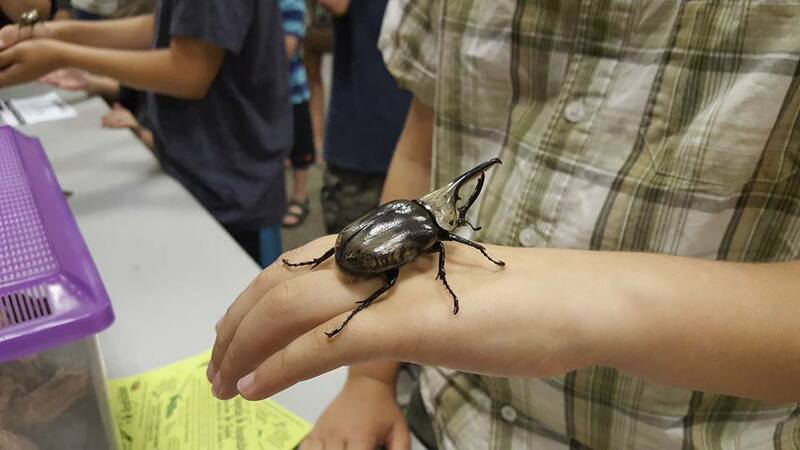 A young Arizona Insect Festival participant meets a Hercules beetle. Now in its seventh year, the Arizona Insect Festival is an annual event that draws people from the campus and Tucson communities for a daylong exploration of insects. This year's festival – happening Oct. 1 from 10 a.m. to 3 p.m. at the Environmental and Natural Resources 2 building – has a new location, new booths and some other fun extras. Cara Gibson, assistant professor of practice and director of science communications in the Department of Entomology, was at the very first festival in 2011. The next year, she was coordinating it – and has been doing that ever since. Gibson spoke with Lo Que Pasa about this "big bug science party" and why even insect haters should consider attending. This year, the UA will hold the seventh annual Arizona Insect Festival. Why does the UA have an insect festival? We feel it's a fun, effective way to deliver on our outreach and extension missions. We hope we are helping to increase science literacy and to raise awareness about the importance of insects. Most people don't realize the silent labors that our tiny neighbors perform day in day out, such as crop pollination, providing food to wildlife, natural pest control, and cattle waste removal. In the United States alone, those services add up to about $67 billion each year. People of all ages come to see insects large and small, sometimes with microscopes. They hold them, make art and poetry, and even taste some bugs! We have an incredible range of activities. At "Build-a-Bug" you can create your own insect, and over at "Bug Brains" you can watch the readout from an electrode embedded in an insect's brain. We think of the festival as our "big bug science party" since the whole event is so much fun. We have six new booths this year: the UA Insect Collection, Desert Dangers, Fruit Flies, Life on the Rim, Aquatic Insects, and Life in a Dead Saguaro. The website has details about these booths and old favorites that are returning. Also, we have a new location. We'll be at the Environmental and Natural Resources 2 building, on the first floor and in the courtyards. From 2012-16 we were in the Grand Ballroom in the Student Union, but many visitors felt that it was too cramped and too loud. We're excited with the new space as it's giving us the opportunity to offer a vendor fair and food trucks. So bring cash! We'll have incredible local vendors on site, including Yikes Toys!, Desert Lather soaps, Satori schools, and The Sisters Press, which just published "The Features of Creatures: Insects A-Z." We'll also have face painting. Each year, there's a "theme insect" for the festival. Can you tell us about this year's insect? This year, the theme insect is the honey-bellied green metallic sweat bee. What many people don't realize is that a lot of bee species are what we call "solitary." There are about 4,000 bee species in North America and most of them do not live in hives. They actually nest singly or in small numbers, often in the ground. Our festival theme bee species is small – about 1 centimeter – and can be attracted to sweat for nutrition. It only bites or stings if heavily provoked. These bees are key pollinators of various cactus species that provide important food and shelter for desert dwellers, such as tortoises and cactus wrens. So, we're hoping that having this bee as our theme insect will increase the number of conversations about native pollinator conservation. In your opinion, what's the best part of the festival? I love that this event gives people a new lens for the unseen or a world that they were fearful of. In the days and weeks following the festival, people will actually stop me and say things like, "I had no idea that insect existed, but I see them everywhere now!" Or they say they used to kill a certain insect whenever they saw it. Then after the festival, they say, "But now I don't feel grossed out by them anymore." This year we have about 125 folks who will be doing the main work of organizing and leading the booths and about 80 community volunteers who will help communicate the science to visitors. The booth leaders are volunteering faculty, staff, post-docs, and graduate and undergraduate students, as well as local community partners, such as staff from the Arizona-Sonora Desert Museum and Tohono Chul. The community volunteers are multigenerational – some kids attended their first festival in diapers and now stand side by side with our scientists communicating research findings. It's truly a fantastic experience for everyone involved. A lot of people try to AVOID insects. What would you say to convince them to come? Some people have phobic fears of these animals and we respect that. We never force anything on anyone. Everyone can come, free of charge, and experience as much or as little they feel comfortable with. If you do come, I guarantee that you will experience a shift in the way you view life here on Earth. With nearly 1 million described species of insects, it's hard to pick just one. So, I'm going to cheat a little bit and say that my favorite group is the parasitic wasps. When you say the word "wasp," most people picture a Yellow jacket. But most wasps are actually quite tiny. Many are about the size of a freckle and yet, under the microscope, they can be iridescent rainbows with exquisite microsculptural details. Parasitic wasps also attack very specific hosts – they never bite or sting humans. In some cases, they are mass-reared in facilities and then released to control crop pests in place of using pesticides. I love them because they are beautiful, have fascinating life histories AND they are effective allies.